I’m repeating this mantra to myself often. That’s all I have to, right? Make good art? That’s what Neil Gaiman says to do. It works for him so why not me? That’s easier said than done. I have to do more than make good art, I have to make art and sometimes that’s the hardest part. I have learned that I am a writer who gets testy when two things don’t happen. Lately, neither has happened and it’s just getting on my nerves. It’s the end of the semester, it’s the holiday season, it’s the time of the year where I get pulled into different directions except for the direction I’d like to go in. That’s the direction toward my writing desk where my computer’s abandonment issues grow worse by the minute. I know what you’re thinking. I’m the queen of time management, finding time to writing even while washing dishes. If you put it that way, I guess I am. Through the years I’ve gotten quite good at writing in the in-between times of life — waiting in lines, in traffic, in meetings (shh! ), while washing clothes, etc. But these gray days have me with a writing itch that I can’t scratch until papers are graded, work is completed, errands are done. I don’t know about you but sometimes I wonder, quite dramatically I may add, if I’ll ever write again. It’s during this time the gremlins begin to fill me with doubt and fear. I feel less writerly and more like a hack. Am I hack? I’ve written things people like to read right? Right. I can write pretty words. Just not today, at this moment. Right now, I can just do enough to pretend I’m a writer, to sit here and stare at the screen with stories needing attention and me just blah…. 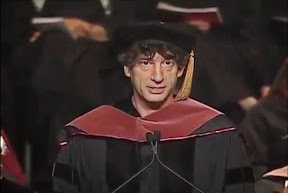 Will all due respect Mr. Gaiman, it’s gray, cold, ugly and it’s been awhile since the sparkly, happy feeling of publication and creation has visited. So, I’ll just settle for art. Anything. Just anything, even if it’s a finger painting. Or a blog post with the most angsty stream of conscious on WordPress…at least for today. Previous postWhen it comes to social media, is it all about the numbers? Next postThe 10 books that changed my life…or something like that.